This post is the last in a 3-part series about an English ancestor who was a fervent anti-vaccinator in the late 1800s. My source for all the newspaper articles was the 19th-century British Library Newspapers online, which were made public in 2009. (They had previously been available to UK higher education communities only.) This is different from the recently launched The British Newspaper Archive, which contains 19th- and 20th-century newspapers and is being updated daily with new pages. Whether the Board of Guardians was busy with other matters, or Joseph found some way to avoid the whole affair, nothing appears to have happened for nine long months, other than a brief notice in August 1883 that “J.A. Petvin of Congresbury, was ordered to have his child vaccinated within four months.” In addition, some time between August and October, Joseph had made a complaint against the vaccination officer, and after considering the case, the local government board said Joseph had no grounds for complaint. The nature of his complaint is not known, but after nearly two years since the time of the first notice, it seems Joseph was a determined fighter. Little Annie Marian would be three years old in a few months, and her father still refused to have her vaccinated. In April of the following year, Joseph ran for election to the Board of Guardians as the anti-vaccination candidate. A great deal of interest was shown in the contest and his supporters expected a majority. But he received only 95 votes, as opposed to the two current members, who received a total of 352 votes between them. Perhaps Joseph had hoped to impose his views and also save himself from prosecution by joining the board. The Petty Session of May 26, 1884 is the last published news I have been able to find about Joseph and his refusal to comply with the Vaccination Act. Once again he was summoned by the vaccination officer, for “having neglected to have his child vaccinated within four months of the order made by the magistrates on the 13th of August, 1883.” Joseph did not appear and was fined £1 and costs. He was also summoned for neglecting to pay 15 shillings, the costs incurred by the officer in a previous prosecution. Worst of all, the bench made an order to issue a distress warrant for the recovery of the payment. A distress warrant involved the seizure and auction of the family’s possessions (excluding beds and linens!) to generate funds. Further research could give more details as to the continuing battle between Joseph and the authorities. Based on the last Petty Session, we know he paid at least half of his original fine, and I doubt that either child was ever vaccinated. In 1898 a new vaccination act was passed, allowing for conscientious objectors and allowing some parents to obtain certificates of exemption. Notably, in the late 1890s, Mr. Petvin represented other people before the Petty Sessions who were being ordered to vaccinate a child. In one instance his objections were described as a “long rigmarole.” It sounds as though they were all growing tired of hearing from him. 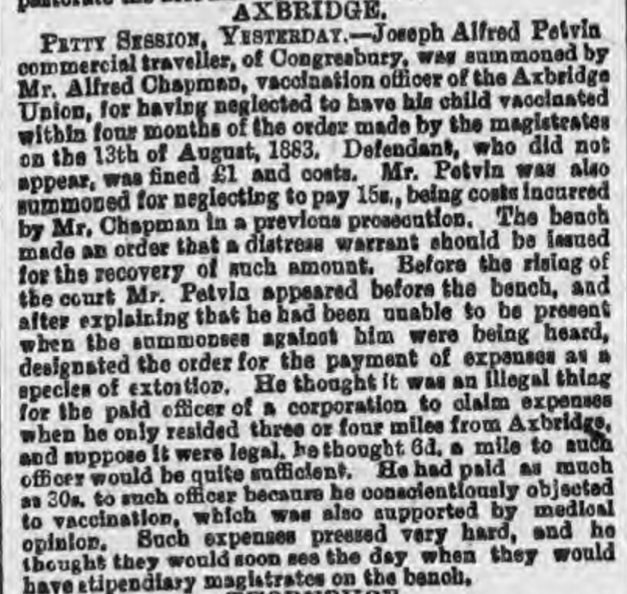 The older child who was overlooked by the vaccination officer was also named Joseph Alfred Petvin, and he lived to the age of 63. 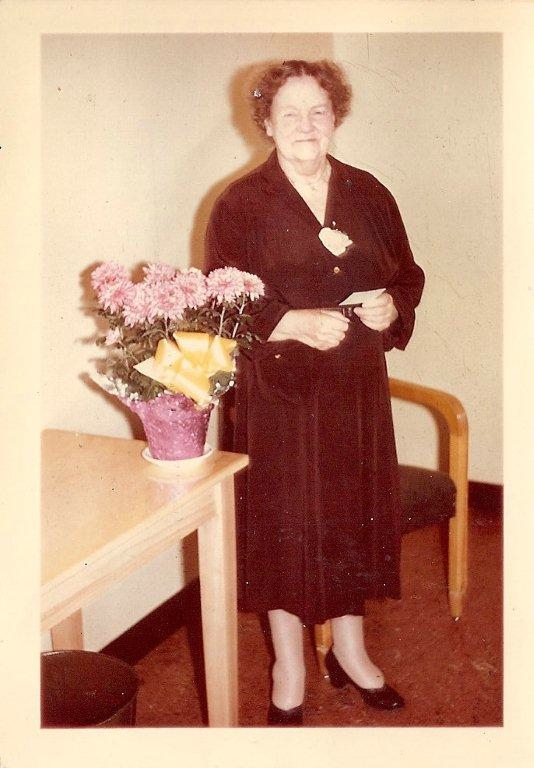 Little Annie Marian, the subject of many a summons to her father, married in 1906 and emigrated to Canada, where she enjoyed a long and healthy life until she passed away at the age 86. As a member of the Petvin family I found this very intetesting, I knew some details about my Great Grandfather but was unaware of his stance against vaccination. Su, it’s wonderful to hear from a descendant of Joseph Petvin. He certainly does sound like an interesting man. I’m curious as to which branch of the Petvins you connect with. Joseph is my partner’s great-grandfather; his grandfather is Joseph Petvin and his mother is Phyllis Petvin (now Blacklock). I feel as though I should know who you are, but my mind is blank at the moment! When you say partner I think you must mean my cousin David, as Phyll is my aunt. My father was Godfrey and I am known as Nan in the family. You are absolutely correct! David didn’t recognise “Su” but certainly he remembers Nan. The last time you saw each other was in 1979!